The consultation has concluded and the responses analysed. This document describes the responses received - it complies with the principles "we asked, you said". It also describes which response elements may lead to an adaptation in the final airspace design. The next document, Step 4a to be published in due course, will detail how those elements have been actioned, complying with the principle "you said, we did". NATS is proposing to systemise and reduce the complexity of eastbound and westbound ATS routes in the Clacton Sector through the introduction of new RNAV1 ATS routes. These changes have been designed in support of the free route airspace implementation (FRA-M) in the Netherlands, east of the UK FIR boundary. The proposed changes would occur above 7,000ft and within existing delegated airspace, mostly over the North Sea. We are seeking feedback from any stakeholders who may be affected; these are most likely to be users of this airspace and aviation stakeholders. However we welcome feedback from any interested parties. The proposed changes would alter westbound traffic flows from Maastricht Delta Sector (MUAC) which currently converge on a single COP named GORLO, as seen below. These would be split into appropriate flows in order to reduce the complexity of the airspace and controller workload; alongside increasing capacity. There have also been changes proposed to partially realign eastbound routes in order to reduce flightplan distances to the UK-Dutch FIR boundary. Diagrams showing a visual representation of changes to the eastbound and westbound flows can be found in Section 3 of the consultation document. A link has been provided below. 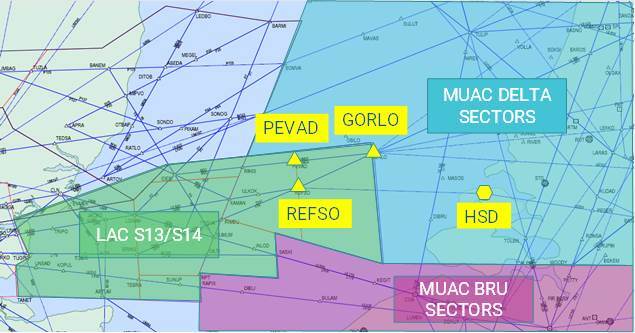 These changes support the planned implementation of MUAC’s free route airspace implementation (FRA-M) in the Netherlands, east of the area affected by the proposed changes presented here.